Note: The following information has been made available to us. Please contact the appropriate school/organization for more up-to-date details as this is not a comprehensive list. Dallas, Texas: U .T. 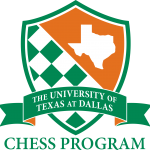 Dallas is known as one of the leading “chess universities” in all of America. The Denker is honored to have a long-standing relationship with the university. The Chess Program Scholarship guidelines apply with regard to GPA requirements and probation. Students may apply online and must meet admission requirements. The University of Texas at Dallas also offers Academic Excellence Scholarships. See http://www.utdallas.edu/chess/scholarships/ for more information. This link to the team video gives you a current look at the UT Dallas chess team and campus. • Brownsville, Texas: University of Texas at Brownsville President’s Chess Scholarship offers two four-year scholarships to top students in South Texas. These scholarships will include tuition, books, and fees with a value of over $10,000 each. •Illinois: Shimer College awards a maximum of $2,000 per person per year. Contact Dr. David Shimer, chess coach, at david@shimer.edu or 312-235-3538. •Maryland: The University of Maryland, Baltimore County (UMBC) offers four types of four-year chess scholarships: 1. Chess-Player Scholar—for outstanding students rated over 2000 (various amounts depending on qualifications, up to $15,000/year plus out-of-state tuition differential) 2. Special Merit for Chess (various amounts, typically out-of-state tuition differential) 3. Tournament-Based Awards—to winners of U.S. Cadet and Maryland Sweet 16 (fixed dollar tuition) 4. UMBC Coca-Cola Chess Fellows—a limited number of fixed dollar tuition awards with $15,000/year food and housing stipends, in return for 100 hours of community service through chess per year. Candidates must be good students with extraordinary chess ratings (over 2500). Undergraduate and graduate students are eligible. To apply, simply submit an undergraduate application to UMBC and indicate your interest in chess. Both domestic and foreign students are eligible (except for tournament-based awards). More details can be obtained from their website: www.umbc.edu/chess. • Missouri • Susan Polgar Foundation: We award scholarships at the Susan Polgar National Open (girls and boys). Each will be worth $1,000 per year (in-state tuition). For out-of-state, it would be equivalent to $9,000 per year or $36,000 total for four years. We offer a full scholarship for the winner of the Polgar Invitational. There are also other scholarship opportunities (partial and full) which are not related to any specific event. Contact Susan Polgar directly at SusanPolgar@aol.com. •Tennessee: Tennessee Technological University offers a four-year scholarship, $3,000 per year ($12,000 total). For more information, contact Dr. Paul Semmes, psemmes@tntech.edu or (931) 372-3139 Tennessee Tech University will offer the following scholarships for each school year: To the winner of the high school section of the Tennessee State Scholastic Individual Finals Chess Tournament: A four-year University Academic Service Scholarship providing $4,000 per year for a total value of $16,000. To the second place winner of the high school section of the Tennessee State Scholastic Individual Finals Chess Tournament: A four-year University Academic Service Scholarship providing $2,500 per year for a total value of $10,000. To the winning team of the high school section of the Tennessee State Scholastic Team Finals Chess Tournament: Four members of the winning team will each be offered a four-year University Academic Service Scholarship providing $4,000 per year for a total value of $16,000. To the second place team of the high school section of the Tennessee State Scholastic Team Finals Chess Tournament: Four members of the winning team will each be offered a four-year University Academic Service Scholarship providing $2,500 per year for a total value of $10,000. For more information on these scholarships, see www.tntech.edu/scholarships/chess.